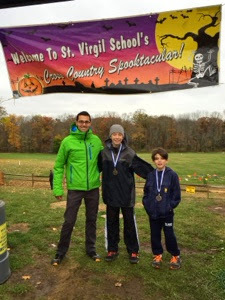 A few brave and hardy runners braved cold, rain, and wind this weekend for the St. Virgil's "Spooktakular" meet held at Central Park in Morris Is Plains. Cristo Milelli (K), Giuseppe Milelli (3rd), Colin Sutter (6th), and James Glockenmeier (8th) all made it to the meet and ran brilliantly. Giuseppe and James both medaled, placing 12th and 5th, respectively. This continues James' streak of winning a medal at every meet this season, and qualifies him for First Team, All League; a recognition from our league. Well done to James, and the rest of the team who made it out in some "real cross country" weather!